How to get MacBook-like Scrolling on Windows Laptop? In this article, I will cover a simple method to get MacBook-like scrolling on Windows laptop. If you have a MacBook or used one, you might be aware of its gestures and scrolling. You are free to argue this but IMO, MacBooks delivers the best touchpad experiences with interactive gestures, smooth scrolling, and tacting click-feedback. Coming back to a Windows laptop from a MacBook feels so annoying especially using the touchpad. Thankfully, Windows Precision Touchpad made the terrible touchpad experience on Windows laptops way better. But what about the laptops which don’t have Windows Precision Touchpad? Well, there is a free and open source program that improve the scrolling experience on such laptops. 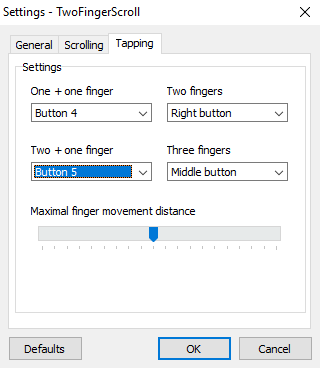 Arkadiusz Wahlig (an independent developer) made a two-finger-scroll program that enables two-finger gestures on Synaptics touchpads. These gestures provide you with MacBook-like scrolling on your Windows laptop along with a few other features. So, let’s check it out in details. To get MacBook-like scrolling on your Windows laptop, visit the software repository on GitHub (link provided at the end of this article) and download the latest version. The software is packed in a ZIP file there; download the ZIP and extract it to get the two-finger-scroll software. Once you have the software, you can run it simply by a double click; there is no installation required. This software sits in the system tray on the taskbar. You can activate/deactivate it from there with the right-click option. This option also has Settings where you can customize software functions as per your liking. Two-finger scrolling: Scroll two fingers (simultaneously) in a vertical direction anywhere on the touchpad. Right now, this software only supports linear scroll which you can keep on edges or anywhere on the touchpad. But, there is a circular scroll option that is said to be added in the near future. Along with that, you can adjust the scroll speed and also enable scroll acceleration with acceleration speed adjustment. 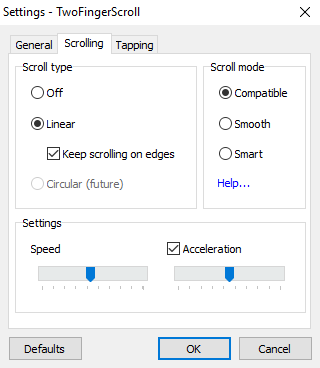 If you experience issues with scrolling, you can try different scroll modes to find the one that works best for you and your laptop. Apart from the scrolling, this software also lets you create and customize tapping. It gives you four different tapping options and lets you assign a mouse function/button to each tapping. With that said, this software really delivers a nice scrolling experience which is close to MacBook-like scrolling. Download two finger scroll for yourself here. This is how you can get MacBook-like scrolling on a Windows laptop. The scrolling is really smooth and responsive; better than my default scrolling. The thing I really miss in this software is an option to reverse the scroll. Anyways, if you are addicted to regular scrolling, it definitely worth a try. It’s hard to explain the scrolling without testing it. So, give it try and share your thoughts with us in the comments.